We visited two of the most impressive and favorite places in all South Georgia in one day, with excellent weather for both. 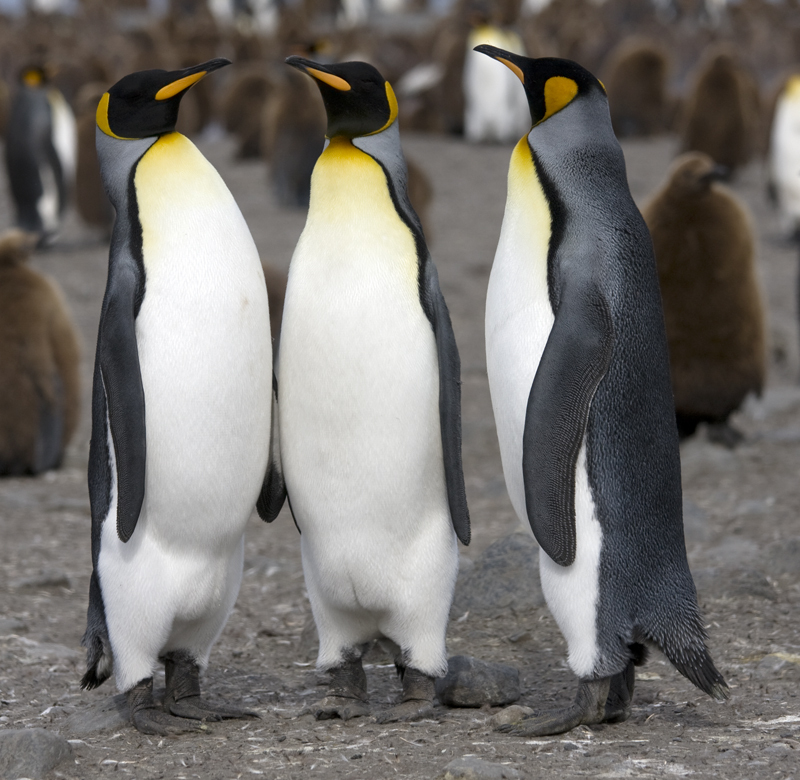 First to St. Andrews Bay, a huge outwash plain fed by the Heany, Buxton, and Cook Glaciers that is home to the largest colony of King Penguins, around 200,000 pairs plus almost as many molting and resting birds. We could see the size of the colony from a distance as we approached the beach in Zodiacs but to get the full impact we had to wade across metlwater rivers lined with molting penguins and climb a moraine to a vantage point. Then it hits us: hectares and hectares of white and orange, an undulating blanket of evenly spaced adult birds draped over the landscape contours and laced with ribbons of brown chicks along the waterways. It’s truly an amazing sight. It’s a biological wonder, too, to realize that all of these birds are made out of fish: they are the profusion of Southern Ocean productivity lapping in a seasonal wave onto the land. Sharon Mosher was excited to see this outcrop with gorgeous folds of foliated turbidites. The early foliation was nearly parallel to the bedding and contained quartz veins that were folded along with the bedding and foliation. These folded veins were crosscut by quartz veins parallel to the axial planes of the folds. These in turn were sheared by the thrust zones and subsequently folded. A wonderful outcrop example of the mountain scale refolded folds that we have been seeing across the island. Gold Harbour is a smaller bay with all the wildlife concentrated between the Bertrab Glacier at one end and dramatic outcrops at the other. 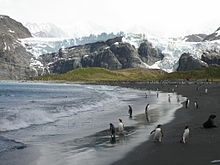 One could simply sit on the beach between rows of lazing elephant seals and watch molting King Penguins, Giant Petrels tearing into a fresh fur seal carcass, skuas scouting, and look up to the bluffs where a courting pair of Light-mantled Sooty Albatrosses shuttled between two ledges. Geologists and bird-watchers braved a fur seal gauntlet up a gully onto a steep grassy escarpment for looks at rocks and more birds. White-chinned Petrels, a very common tube-nosed seabird that look like miniature albatrosses, burrow under the grass tussocks to nest. We could smell their distinctive oil as we navigated the grassy maze and found many burrow entrances by our feet. 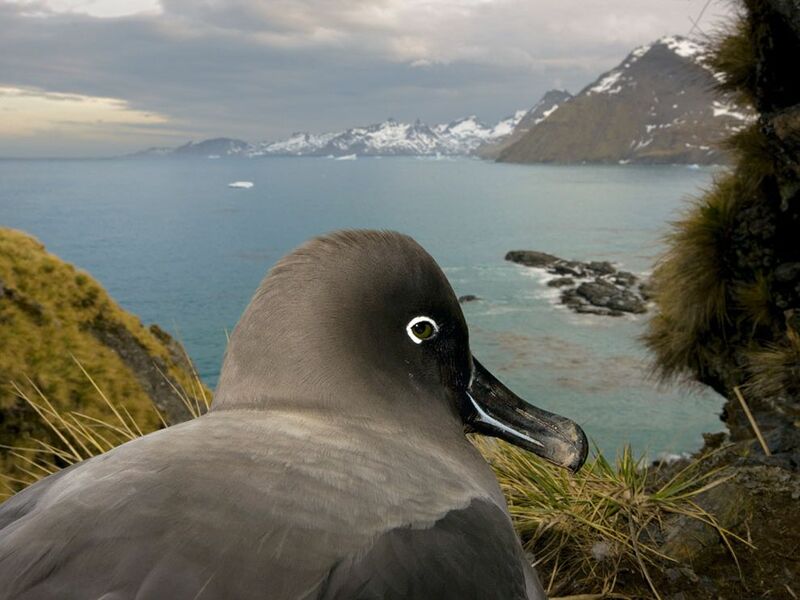 Across a gulch we watched one Light-mantled Sooty Albatross sitting peacefully on its nest. At long intervals it stood up to check its tiny, fluffy light-grey chick, and eventually our patience was rewarded when it gave the chick a feeding of thick fish oil from its throat. The tenderness and attentiveness of these beautiful parent birds is touching, as is the unison flight that bonding pairs do. We’ve seen this at several of our landings, including today, when the courting pair above the landing got into sync along the cliff face. Tim Carr picked a path for the geology group with Ian Dalziel, Rudolph Truow, Richard Alley, and Rob Dunbar up and over the ridgeline, down to the bench at sea level below. They were looking for the contact between the Sandebugten and Cumberland Bay formations, but that turned out to be a little farther south inside Gold Harbor. Mindy Kimball reports, “On the beach at Gold Harbor we saw some really neat boulders of Cumberland Formation where you can very clearly see the contacts between successive turbidite flows. This stopped a large group of geologists for a good 15 minutes as they argued about which direction was up (there were flame structures, inclusions, etc. but no agreement on which way was up).” Later, a couple of sedimentologists arrived and clarified the direction. It was very hard to leave such a beautiful place as Gold Harbour, even more so to pull away from South Georgia entirely after this last landing, despite the allure of the hot tub on the roof of Deck 6 of the ship. It seems we just scratched the surface of South Georgia’s wonders. On the back deck of the ship there were cameras and sketchbooks capturing last views of this Southern Ocean paradise, and talk of skipping the Antarctic Peninsula to stay here for the rest of the trip. The ship moved onward, though, and during supper we moved into the open ocean on our way to The Ice.